Solar heating for pools is a reliable technology. Water from your swimming pool, after flowing through your pump and filter, is transferred to solar panels and then returned to the swimming pool. Using solar energy warms your swimming pool without the expense of a gas heater and increases your swimming season by several months! The result of constructing a solar pool heating system is that Spring is no longer the time where you sit around waiting for your pool to heat up. Fall is more time for swimming, not when you pull out your winter pool cover. And summer is when you appreciate perfect pool temperatures for you and your family. For additional information about how to have pool temperature control with a Heliocol solar pool heating system, connect with Solaron in Brentwood at 916-631-9293. 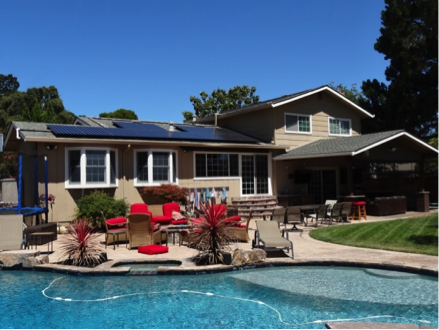 Our specialists come to your household, examine the landscape and the pool and present a free consultation for a solar pool heater installation. Trust Solaron for quality products in solar pool temperature control! Solaron uses energy for life!